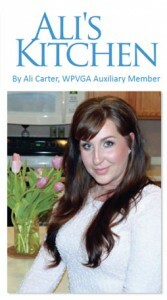 In this technical age it’s easy to log onto a blog, website, or Pinterest and find a recipe for practically anything. Unfortunately that ease has caused me to no longer turn to my favorite cookbooks for ideas as often as I used to. Seeing this stack of forgotten books inspired me to sit down in my favorite chair and wile away the rest of that afternoon perusing the recipes. I’m sure it won’t surprise you to learn that in this stack of books were many about potatoes. One book in particular caught my attention. The All-American Potato Cookbook published in 1982. I was particularly interested in the cake and bread recipes. 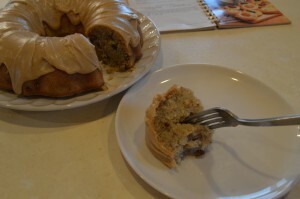 My first pick out of this cookbook was a spice cake with caramel frosting. It turned out fabulously! The cake itself was dense and extremely moist, I can’t wait to share this with you! I made some changes to accommodate my family’s preferences and to make use of what I had on hand. Isn’t that the beauty of a recipe? You have the freedom to be as creative as you want to be and simply enjoy the process. Preheat oven to 350 degrees. Grease and flour a 9×13 inch pan (I chose to use a bundt pan). Cream sugar and butter in a large bowl until fluffy. Add potatoes and eggs; blend well. Combine flour, cinnamon, salt, nutmeg, and baking powder in a small bowl; mix lightly. Alternately beat dry ingredients and milk into the creamed mixture until well blended. Stir in raisins (or pecans). Pour into prepared pan. Bake 45 to 55 minutes, or until toothpick inserted in the center comes out clean. Cool completely before frosting. Melt butter and brown sugar in a small saucepan on low heat. Cook about 2 minutes, stirring constantly. Add milk; bring to full boil on medium-high heat, stirring constantly. Remove from heat. Cool slightly. Beat in sugar with an electric mixer until consistency is easily spreadable. This frosting recipe makes more than I personally think you need for the cake and is quite sweet so make adjustments to your taste. 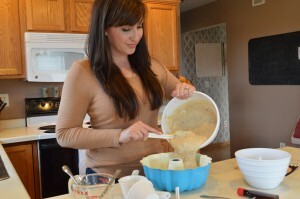 Oh, and a little tip….the frosting sets up quite quickly as it cools so do not wait too long to frost your cake. The perfect treat to be savored with a cup of coffee on a chilly evening with a loved one. Enjoy! Follow Bushmans' Inc.'s board Potato Grilling on Pinterest.